Next Meeting: Wednesday, June 20, 2012, 6:30 p.m. – 8:30 p.m.
We meet at the Unitarian Universalist Society Church located at 152 Pearl Street in Burlington, VT. We will be in the Sophia Fahs Community Room, a large room located in the basement. Join us for Open Bindery in June! Unfortunately, Margery Cantor is not able to present at our June meeting, but we look forward to having her share her letterpress expertise with us in the future. Instead, we have a program designed to get your summer bookbinding endeavors off to a roaring start. This month, we invite you to bring a project to work on and join us for the Book Arts Guild’s first-ever Open Bindery! We hope to create a collaborative space where we can work on our own projects while at the same time sharing ideas, offering each other assistance, and inspiring each other. It also provides an opportunity to get to know each other better, to catch up with old friends, and to share what we’ve been working on. Our mini-bindery will offer equipment such as book presses; a Kutrimmer™; a Xyron™ (a non-heat, non-spray alternative to wet adhesives), sewing frames, a Zutter Bind It All™ spiral binder, cutting mats, and various hand tools. There will also be a mini-library of books on bookbinding and book arts for instruction and inspiration, and materials available for purchase, such as bookboard and PVA glue. We think it will be a very enjoyable and productive evening, and look forward to seeing you there! Our May meeting was such fun with Robin Cooper Collins leading us all on the makings of a very special movable mechanism that she discovered during a restoration project. Robin first provided us with an introduction of her work with the restoration and conservation of antiquarian children’s books. We were all fascinated by the detective skills, technology and wealth of art techniques Robin applies to her projects. Robin, thank you for sharing your unique expertise with us on antique children’s books and for guiding us though the makings of challenging movable mechanism. We have pictures from the meeting, but they’re not on the blog yet. As soon as they’re posted, we’ll let you know. *** The Book Arts Guild of Vermont is pleased to announce that book artist Daniel Kelm will be coming to Vermont to offer The Book Restructured: Wire Edge Binding, a two-day workshop from 7/28/12 – 7/29/12. Book artists produce a truly remarkable range of books – some diverging wildly from what we recognize as traditional book form. Wire edge binding, which employs a thin metal wire along the hinging edge of each page, was developed by master bookbinder, artist, and innovator Daniel Kelm to meet the challenge of creating a nontraditional book that opens exceptionally well and allows for unusual shapes. During this two-day intensive workshop, which includes two projects, you will master basic wire edge skills for producing highly functional bindings of both traditional and unusual shapes. The first project – a simple codex of six identical page panels – teaches you the basics of integrating metal wire into a paperboard construction. The second project – an accordion with triangular pages that fold to form a tetrahedron – teaches you how to make books of various geometric shapes. Space is limited and B.A.G. members are getting a head start on registering, so sign up as soon as possible! Click here to download the registration form. For further information about the workshop, please contact Jill Abilock at (802) 238-0883 or SixLoonsStudio@gmail.com. *** The May/June exhibition at the Creative Space Gallery in Vergennes, VT includes work from our 2012 spring exhibit, Shaping Pages. Featured work includes handmade books by B.A.G. members Jill Abilock, Janet Ballantyne, Eloise Beil, Elissa Campbell, Elizabeth Rideout, Maryann Riker, Nancy Stone, Annie Watson, and Cynthia Weiss. There will be a reception with the artists on Friday June 2nd from 5:00 p.m. – 7:00 p.m. You can also visit during gallery hours on Thursday – Sunday, now through June 24th. *** The New England Chapter of the Guild of Book Workers is holding their annual meeting on Tuesday, June 26th, at 6:00 p.m. This meeting is open to all current chapter members. The primary item of business is the election of an entirely new chapter committee. The presumptive committee members will be happy to speak with members about ideas for upcoming chapter activities. Outgoing Chapter Chair, Jeffrey Altepeter, will give one last annual report. The meeting will be held at The Independent at 75 Union Square in Somerville, MA. If you plan to attend, please RSVP to Jeffrey Altepeter. *** The Museum of Printing in North Andover, MA will be having its Ninth Annual Printing Arts Fair on Sunday, June 17th, 10:00 a.m. – 4:00 p.m. The Fair is free and open to the public. The Printing Arts Fair brings together printers, artisans, booksellers, graphic designers, specialty paper vendors – anyone interested in the printing arts – in a family atmosphere. 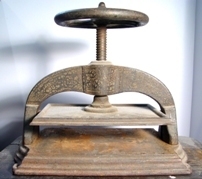 Live demonstrations of turning molten lead into type, letterpress printing, intaglio printing, paper making and more. For more information, please visit please visit The Museum of Printing’s website. *** The Photo-Bookworks Symposium, presented by the Visual Studies Workshop, will take place from June 28 – 30, 2012 in Rochester, NY. For the 2012 Photo-Bookworks Symposium, Visual Studies Workshop has invited national and international artists, critics, curators, and publishers to discuss some of the most challenging and innovative photobooks being created in the world today. Learn about the history of the medium, about being published and self-publishing, how artists and bookbinders are expanding the form, and much more. There will also be a special pop-up bookstore by ARTBOOK as part of the symposium. Titles by the presenters and numerous other photobooks and artists’ books, including recent titles from VSW Press, will be available for purchase at discounted prices. There will be book signings by all the presenters throughout the symposium weekend. For further information or to register contact Kristen Merola at workshops@vsw.org. *** Art New England is offering Artists Books To Go with Aimee Lee from 7/29/12 – 8/4/12 at Bennington College. In this workshop, students learn key ways to build artists’ books with a minimum amount of equipment and environmental impact, and explore the book form as a repository for images, text, and ideas. Students experiment with a variety of folded and sewn structures that can easily be made at home or on the road. They also learn how to manipulate paper into pop-ups and unconventional pages that draw from fiber techniques. Transfers and mark-making techniques will convey content and students will gather tips on how to maintain a portable tool kit. Participants will leave with an armful of books and the knowledge and confidence to make books anywhere and anytime. This class is suitable for all levels of experience. Registration is available online. To learn more about Aimee Lee, please visit her website. 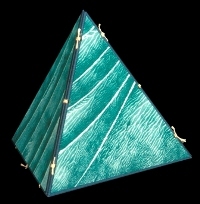 *** Book Arts at the Stone House will be offering workshops from July 23 – 29, 2012 in Freeport, Maine. Spend seven days beside the sea attending a series of book arts related workshops, filled with a wide range of topics including printmaking, cyanotypes, paper-making, marbling, sequential images, inventive fold books, book design, and box making. During the course, each student will have the opportunity to work with 8 different instructors in half day and full day workshops. Every participant will be exposed to a variety of approaches and opinions from a stimulating group of professional artists. Please visit the website for more details on the location and how to register. *** From 8/3/12 – 8/5/12, Velma Bolyard will be teaching Pulp Clouds: Hand Papermaking at the Long Ridge Farm in Westmoreland, NH. In this workshop, you’ll gather plants, cook pulp, form and dry sheets of your own papers. Expect to make strong, useable, and beautiful waterleaf (un-sized) sheets. You’ll make a book from your papers, binding sheets into sample books utilizing structures that allow you to explore bookbinding as well. Each participant may expect to make a portfolio of sheets of various sizes from at least five different plants. The fee for the workshop is $500.00 with a limited materials list. For more information, please contact Long Ridge Farm. 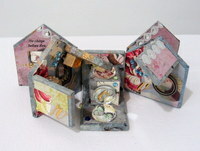 *** From 8/27 – 8/31, Erin Sweeney of Lovely In The Home Press will be teaching Book School 2012 in Peterborough, NH. From 10:00 a.m. – 4:00 p.m. each day, you’ll tackle a new structure, and discuss form and content appropriate for each. Simple writing exercises will be explored to create and organize ideas for future projects. Projects include the Piano Hinge structure, several album structures, a traditional long-stitch structure, boxes, and a Plunder Book to wrap it all up and utilize our newly learned techniques. For more information or to register, please contact Erin at erin@erinsweeney.net.